To ensure successful virtual machine live migration, Oracle VM Manager requires the processor family and model number of the source and destination computer to be the same. A server processor compatibility group is a group of Oracle VM Servers with compatible processors, where a running virtual machine on one Oracle VM Server can safely be migrated and continue to run on another Oracle VM Server. Although Oracle VM Manager contains rules for server processor compatibility, you can create custom compatibility groups to ensure the ability to do smooth migrations is improved. 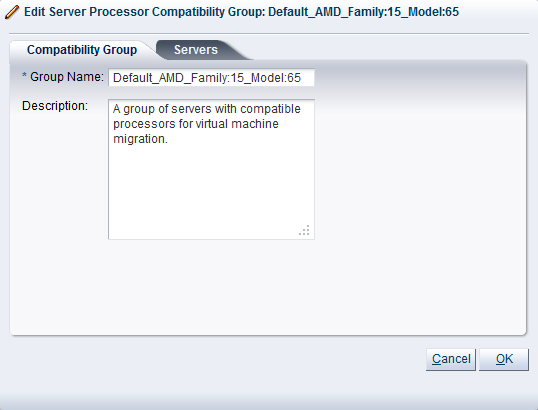 If live migration is attempted between incompatible processors, an error message is displayed. All Oracle VM Servers are added to a default server processor compatibility group as they are discovered. A default server processor compatibility group is created when an Oracle VM Server is discovered if that Oracle VM Server has a processor that is new and unique to Oracle VM Manager. Each server processor compatibility group may include Oracle VM Servers that are members of one or more server pools. An Oracle VM Server may be included in multiple server processor compatibility groups. 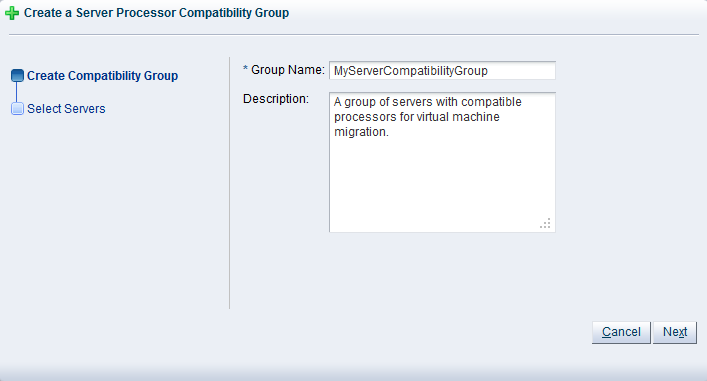 You can create server processor compatibility groups and select which Oracle VM Servers to include according to your needs. There is no limit to the number of server processor compatibility groups you may have. Click the Servers and VMs tab. Select Server Pools in the navigation pane. From the Perspective field in the management pane, select Server Processor Compatibility from the drop-down list. Click Create New Server Processor Compatibility... in the management pane toolbar. 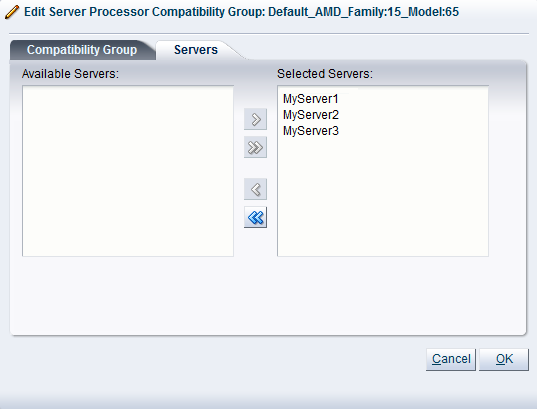 The Create a Server Processor Compatibility Group wizard is displayed. Group Name: Enter the name of the server processor compatibility group. Description: A description of the server processor compatibility group. 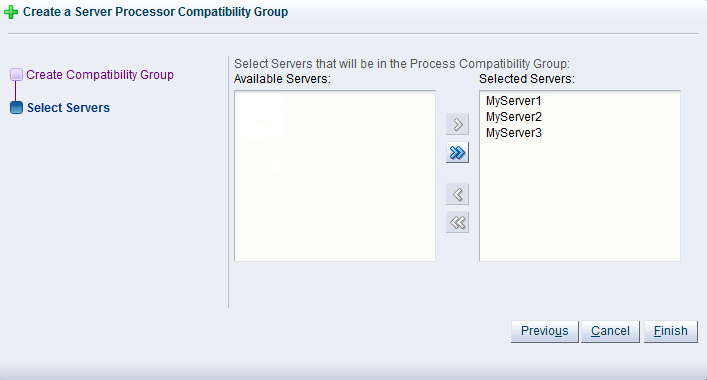 The Select Servers step of the Create a Server Processor Compatibility Group wizard is displayed. Select the servers to include in the server processor compatibility group and move them from the Available Servers column to the Selected Servers column. The server processor compatibility group is created and listed in the Server Processor Compatibility Group table in the management pane. In the Servers and VMs tab, select Server Pools in the navigation pane. From the Perspective field in the management pane, select Server Processor Compatibility from the drop-down list. Select the server processor compatibility group in the Server Processor Compatibility table and click Edit Server Processor Compatibility... in the management pane toolbar. The Edit Server Processor Compatibility Group: group_name dialog box is displayed. Edit the server processor compatibility group as required. To edit the servers in the server processor compatibility group, click the Servers tab. The server processor compatibility group is edited and displayed in the Server Processor Compatibility Group table in the management pane. From the Perspective field in the management pane, select Server Processor Compatibility from the drop-down list. Select the server processor compatibility group in the Server Processor Compatibility table and click Delete Server Processor Compatibility in the management pane toolbar. A confirmation dialog box is displayed. Click OK to delete the server processor compatibility group. The server processor compatibility group is deleted.